S&S Cycle is known for racing heritage as well as vast performance products from intakes and exhaust, all the way to complete engines that compete in the NHRA Pro-Stock motorcycle class. That being said, we are looking for someone with initiative, commitment and a desire to make history! We are hiring a full-time apprentice level race engine builder to be a part of our Viola, Wisconsin product development facility. 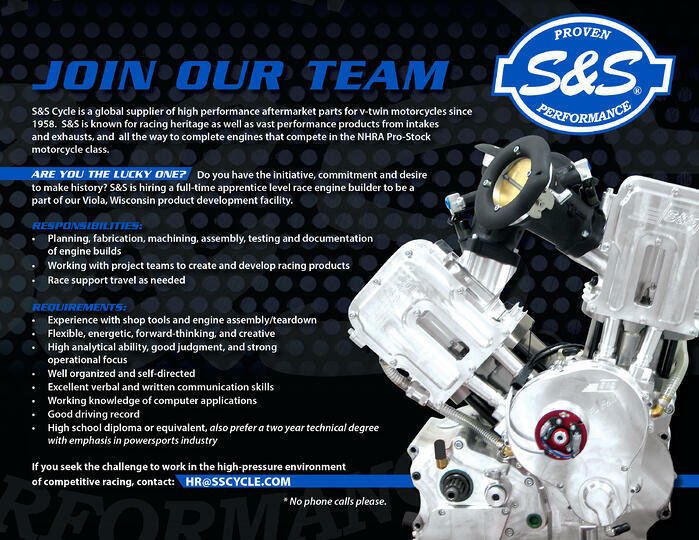 If you seek the challenge to work in the high-pressure environment of competitive racing, contact hr@sscycle.com. No phone calls please.